There is no larger scale project yet that could get people pre-assembled boards. If it's for a single board, you could ask around if someone would build one for you. As a foretaste, I put a comparison between the old and the new interface. Unfortunately, at this moment I do not have the possibility to compile this UI to GBS due to the lack of a microcontroller. But I hope RAMA will do it faster. The new design is up! I really like the segmentation, it makes navigation a lot quicker for me. The colors match well and the font looks cool. It will constantly repeat this, without displaying any image. Edit: Ok nevermind. I just selected a custom preset and now it suddenly works.... okay. Weird. Let me guess: There was no RGBHV source connected / active, right? Like I say, as soon as I clicked a custom preset, it suddenly started working. 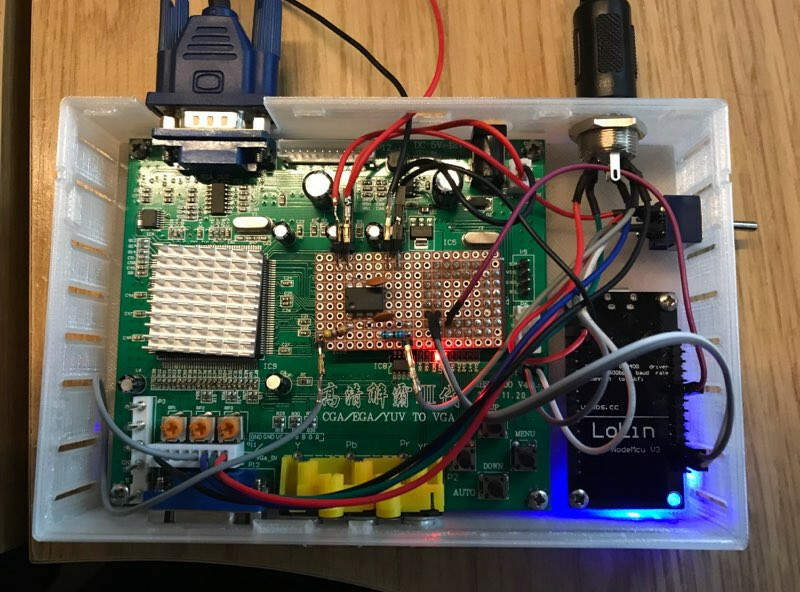 I've seen such readouts happen when the ESP8266 has bad contact with the I2C bus, or when power to the GBS is missing. There's already guards in place to detect this, but it's not perfect. Sometimes a misreading gets through. But oh well, maybe I'll find it one day, maybe not. I don't expect this to happen much in the field, and a reset or changing the preset would make it clear / fix the problem. I did have my 8bitdo wireless SNES controller connected via USB to the same computer, and when I disconnected that, it started working normally too. First of all congrats on a great project. I decided not to mount the LoLin on top of the chip mainly as I wanted to get it as far away as possible from the scaler chip (as mentioned in the wiki) also i needed some extra space in the case for my custom connector. I've therefore added the syncsplitter circuit to the left of the chip mount. Case is my custom design based on the one on Thingiverse. I've changed it a quite bit, in particular widening it and adding extra holes for my connections including a USB power input. Anyway once I've finished the top part I'll pop the design on Thingiverse. The main video input is a 6pin DIN socket which I chose as a few of the retro computers I want this for (BBC Micro, Amstrad CPC) have a 6pin DIN RGB output making it easier. 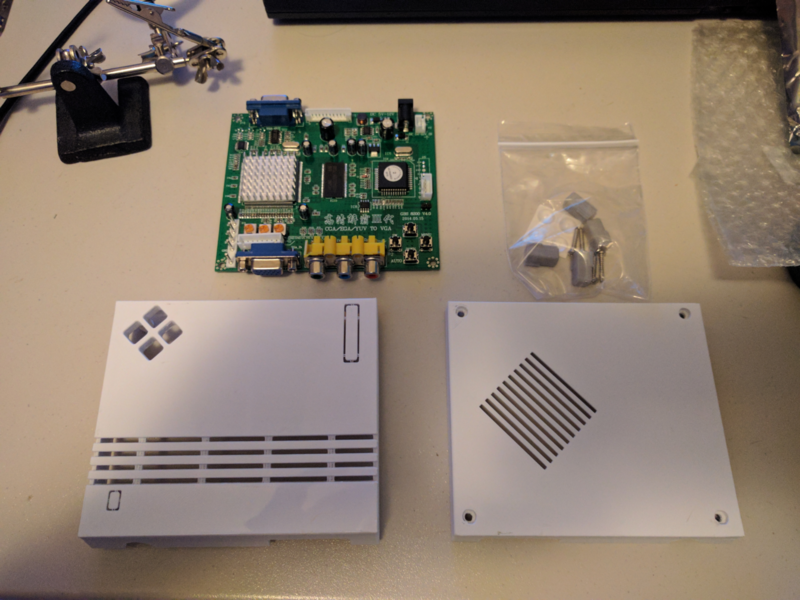 I've also created a 6pin DIN to female SCART adapter (with audio breakout) for the rest of my computers and consoles. Works great and so far I've tried this with Sinclair ZX Spectrum 128k, +2 & +3, Amstrad CPC, BBC Micro & Sinclair QL. The switch on the right is used to turn off the CFW. I have added this as one of my old computers (Sinclair QL) doesn't play well with the CFW. The display is nice and crisp but the CFW cuts off the image when using Monitor Mode (80 col). I believe this is because of the non-standard output of the QL, however, the normal firmware displays it fine so I just revert to that if I need to. I've tried every option in the menu (Move Picture, Border, Scaling etc...) and can get it nearly ok but as you can see from the photo it is just off (top is normal FW, bottom CFW). Any ideas would be greatly appreciated as I would prefer just to use the CFW due to it's much better picture quality and 50Hz output. I'm just going over your web page. This is an impressive collection of GBS 8200 stuff right there! Ah, I see you also removed the Rset resistor for the LM1881. It seems to work just fine and reduces complexity, but I always wonder if it's really okay to do that. As long as nothing oscillates, it's probably safe at least. You may have noticed the SOG coupling capacitor page on my wiki. This allows you to get rid of the LM1881 entirely and let the TV5725 do this job. For the QL, it looks like all you want to solve is that the right side of the image is cut off? but cuts off some pixels if the source makes use of all the available display area. A fix for that will be an image quality compromise, but it is doable. Many LCD monitors actually work with home computer timings. 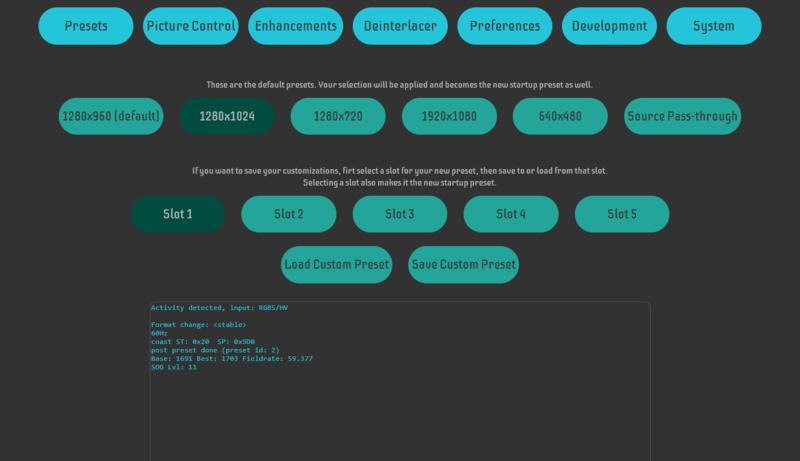 It's simple to give it a try: Select bypass mode in the web ui / presets section. For my LCD, this works with 15kHz sources, if they're @60Hz. 50Hz works, but only if the source isn't interlaced (288p). For the QL, yes it cuts off a few pixels on the right (only 3 or 4) so if it was possible to fix that even if it lowers the picture quality that would be great especially if it is an option in the menu to turn on/off. I did try the pass through but it wouldn't show anything on my main monitor, on my older monitor which is ok with a 15kHz input it shows fine but keeps loosing sync. Anyway, do you have a terminal connection to your ESP? Your horizontal image should shrink, and in case you use test pictures, they shouldn't look too bad either. The command chain isn't exact, but please tell me if that's good enough to show all active pixels. Perfect the whole screen is now visible after a bit of minor tweaking in the Picture Control menu. In fact you could probably even make it a little wider as there is a gap now between the right edge of the screen and the green area (assume that is the true edge of the screen). Quality looks fine, better than stock FW anyway. I'll try and find parameters that hopefully allow the full area to be shown and still have good quality. If there's a good match, it can be the new default. Otherwise there can be an "overscan" option or smth. That green area is the limit of the upscaler / digital processing units. There are several line buffers that dictate how many sampled pixels can be used when upscaling. The goal is to maximize these buffers, but not exceed them. Also for anybody that is interested I've finished my custom case and uploaded to Thingiverse https://www.thingiverse.com/thing:3562194. It is based on the original by Maxik234. Ooh, nice, I'd like to get back into messing around with a GBS and this case looks like it would be a great fit. How much is it and who do you recommend out of those three printer options on Thingiverse? TomDD - Maybe if you had some time you be able to create a 3D housing model based on this project? I'm asking because at least in my opinion this is one of the most beautiful enclosures I found on the internet, and unfortunately the person responsible for the project has never shared 3D model. The micro USB port on the ESP8266 dev board should be accessible. I worked on the active video problem yesterday. It looks like I can make the 50Hz/PAL presets (at least the x960 one) correct by default. 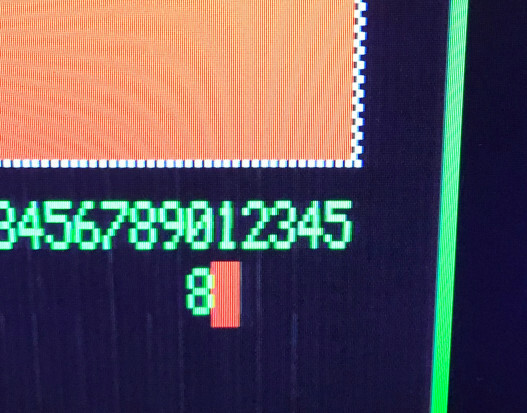 The 60Hz/NTSC presets however simply don't have a good pixel clock "slot" where all parameters align well. So I think I'll do the PAL presets and then figure out something for NTSC later. I've never used any of those printers so not sure who would be best to be honest. In terms of cost I don't think it will be cheap as it takes around 18hrs to print all the parts on my printer. I did check out the cost with the first one and it came to $46 which is about right, I would charge about £30 for this size of print mainly for the time it takes. Last edited by TomDD on Sun Apr 14, 2019 7:27 pm, edited 1 time in total. I'll take a look but I'm pretty happy with my current box so won't promise anything. I did think about powering the whole thing off the NodeMCU but thought better of it in the end. The NodeMCU can definitely be turned around so maybe and option to pop a hole in the front as you say. I'll look into it. Thanks for the info, much appreciated!